What if my child doesn’t want to learn spelling, vocabulary, or math? The idea of Unschooling is to let your child decide what they want to learn and how they want to learn it. The idea is not to push a certain curriculum on them or make them do it for a certain amount of time or even visit it every day. Children learn through play and to allow them to be their own teacher. What does this mean for you as a parent? It means you have to let go and trust your child. 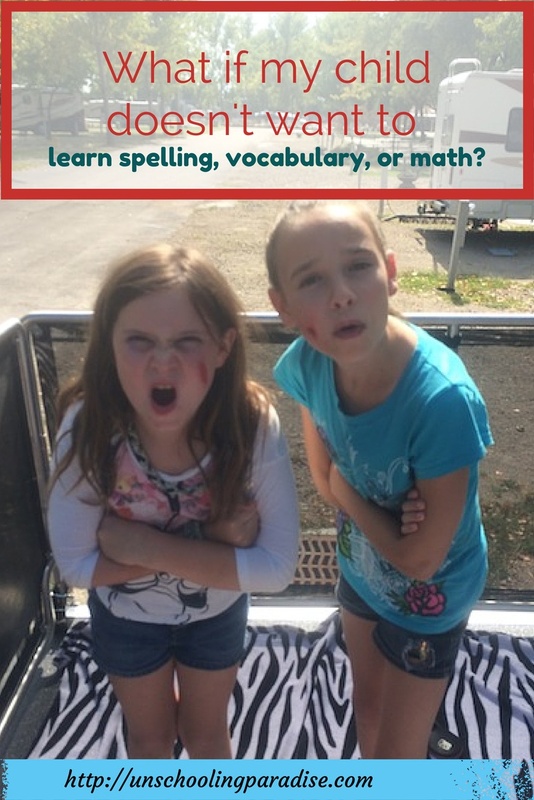 What if your child doesn’t want to learn spelling, vocabulary, or math? Believe me, this is very hard for a lot of parent and teachers. You will also likely get a lot of resistance from well-meaning family members. I had a hard time doing this myself, but I am here to tell you: It works! So how will your child learn spelling, vocabulary, reading, and math? It is actually so simple it’s a little scary. Let them play, back off, and when they are ready to learn, they will. Yes, you need to read to them every night, find books they enjoy, play audio books, get magazines, make them read a recipe while you cook, etc. If they don’t know a word, help them sound it out and explain the definition. Don’t be afraid to answer, “I don’t know the answer, but let’s find out together.” When they are ready, it will sink in, and you will be amazed. No, I did not believe this when I started, and it was so hard to back off and just let them play, but it works. I actually have some homeschooling friends and friends who send their kids to public and private schools who have told me I am letting my children down and they will never succeed in life. Well…I guess time will tell. I have faith. Here is my little story of what I did with my daughter and how awesome she is reading now. My youngest daughter was reading at a kindergarten reading level at age eight in second grade, and I was horrified. I wasn’t horrified that she couldn’t read, but because this elite private school had let her down and told me that homeschooling would make it worse. After deciding to Unschool and did tons of research (and I mean TONS) on “How to get your child to read.” I came to the conclusion that I needed to back off. Jump forward one year, and she was doing a little better but just not interested in reading or spelling. Jump forward ANOTHER year and we started traveling in a RV across the US. She is now about a first grade reading level. Six more months into it, I really was so worried about navigation and everything else I just didn’t let it get to me. Belle begn to ask for help so I did more research and found an amazing program. The program I found, TTRS (touch type read spell) has helped my daughter so much. It only takes 5-10 minutes a day, and the girls love it. The best part is it was designed for children with learning disabilities like Belle. It has helped both girls and there reading and spelling has improved 200% . In time, she began reading to me, and I was blown away. I was amazed! All of a sudden, she was reading at a fifth grade reading level! I got her loads of books, we committed ourselves to listen to audio books on moving days, she reads when we cook, read signs, historical markers, etc., but I had no idea how much it was sinking in. She seems to have woken up one day starting to ask how to spell things, asking about new words, wondering how to spell words, and curious to know the meaning of words and more. Math skills have developed the same way as spelling and reading. We play a lot of Monopoly. When we make purchases, I give the girls money, and while the cashier was punching numbers in, I would make my kids figure out the change in their head and tell me what to expect. The cashiers were impressed! Just this month, we started on Khan Academy. They have already mastered half of last year’s math in one month. I am impressed and figure at the rate we are going, we will be done with next year and the year after by the end of this school year. So, in conclusion: Do what best for your family. There is no wrong or right way, and, really, just back off a bit, and your kids will amaze you. Let them tell you what they want to do for reading, spelling, vocabulary, or math. Remember there is no Common Core guy going around and watching you though your windows, unless you have a nosy neighbor. Good luck if you do. I can’t help you with that one. Tell me your story. I would love to hear it! This entry was posted in Math, Reading/Language Arts, Unschooling, Unschooling FAQ and tagged language arts, Math, reading, science, spelling by Chrissie. Bookmark the permalink.